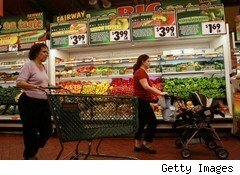 The U.S.Department of Agriculture has confirmed what you likely already know: Food prices are on the rise. In January, the department forecast a price increase of 2.5% for 2011; last week, they upped that to between 3% and 4%. We're expected to see the bulk of that increase toward the second half of the year, but you -- the consumers -- know it's already pretty evident: Major food manufacturers like Sara Lee (SLE) and ConAgra (CAG) are starting to increase prices on items such as frozen meals and deli meats. And other companies, like Kraft (KFT), may reduce the size of packaging to cut costs. All this translates to a higher grocery bill for you. What is driving these price hikes? I'm not just talking about the soaring gas prices we've been shaking our heads over. Beginning in July of last year, we also started to see a pretty sharp increase in corn prices, according to Darrel Good, an agricultural economist and professor at the University of Illinois. "The price of corn has basically doubled since the end of June last year," Good says. "There are three or four factors that are fundamental to rising prices, but first and foremost, crop problems resulted in a smaller-than-expected output." We also saw a rapid expansion in demand due primarily to corn's use in ethanol. But corn's not the only problem. There's been an increased demand for soybeans. Meat prices, too, are headed up, because of large price increases for livestock cattle and hogs. Producers of livestock have been slowly losing money, so they've reduced supply. And as basic college economics taught us, when the supply is down, prices go up. Darrel Good says whether prices will continue to rise depends on what happens to crop production in 2011 -- if we have a favorable growing season, we can replenish some of that lost inventory. If prices do stay up, the cost of living will take a hit. If your budget is already stretched by gas prices, these price increases are going to push it even further, which means you may be faced with hard choices when it comes to discretionary spending: eating out, entertainment, new high-tech toys. It's time to go over your budget and see where you can cut back (cable and cell phone are always good places to start -- these companies are typically negotiable). Then put a hold on major purchases to give yourself a chance to adjust. This means making a plan -- and a list -- before you leave for the grocery store, so you know exactly what you're buying. Take some time to survey your stock: Know what you have and what you need. Limit impulse purchases. It helps to make one big shopping trip each week, rather than several. That way, you only have to walk past the magazines, candy bars and exotic fruit once. Dedicate yourself to clipping coupons (worth a valuable $1.12 apiece on average) for things you regularly buy and need, and buy things when they're on sale, particularly non-perishables. Give store brands another look. And compare prices between stores, because you might be surprised. Wegman's, for instance, announced earlier this year that they wouldn't be raising prices on 40 staple products in 2011, despite rising commodity prices. Bananas, orange juice, tuna, cereal and frozen vegetables are on their list. This is particularly important now that package sizes are shrinking: You need to get into the habit of looking at not only the retail price, but also the unit price. This will show you how much you're paying per ounce, pound, quart or other measurement, so you can compare products of different sizes and see where the best deal is. Often -- but not always -- you'll save by buying larger sizes, so pay attention. If you stick to the outer aisles -- or shop at a farmer's market come spring, where prices don't reflect gas costs to truck food across the country -- you may not be hit quite as hard.